Allyson West is the Registered Dietitian with High Point University Dining. 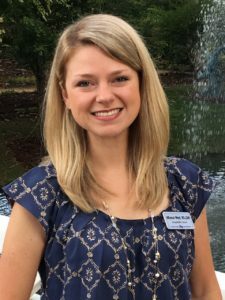 Allyson holds a Bachelor’s Degree in Human Nutrition and Dietetics from the University of North Carolina at Greensboro as well as a Fine Arts Degree in Contemporary Dance from the University of North Carolina School of the Arts. Allyson is a member of the Academy of Nutrition and Dietetics and the Sports, Cardiovascular and Wellness Association. Allyson is also a member of the North Carolina Dietetics Association. Allyson has four years’ experience as an inpatient dietitian with Cone Health prior to joining Higher Education. nutrient-dense choices available across campus every day. Healthy dining options are vital for overall well-being and nourishing the campus community is a top priority. Allyson is available to provide guidance to ensure healthy eating as a lifestyle here on campus. Allyson can aid the campus with dietary allergies or preferences as well as provide individual and group nutrition tours to familiarize the campus community with the dining opportunities. Allyson will be providing specialized presentations and tabling events throughout the year to increase awareness between nutrition and healthy living. High Point Dining © 2019 High Point University. All Rights Reserved. Higher Education Website Design by NMC.